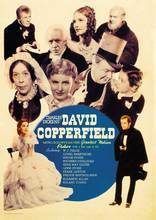 David Copperfield suffers the death of his parents, a cruel stepfather, and employment as a child laborer; he makes his way to Aunt Betsy, a spinster who can't much stand boys. The 800-page Dickens novel is difficult to adapt to screen; necessarily some characters had to be omitted. This adaptation does better than any other. Received Oscar nominations for Best Picture, Best Assistant Director, and Best Editing.